Below are the sales tax allocations for August 2016 vs. August 2015 (retail sales made primarily in June). This data reflects RETAIL sales of goods and services subject to LOCAL sales tax. Our sales tax payment (receipt) for August was $59,668. This represents a 17.20% increase in our net payment compared to the same time last year. Basically, consumers spent more money locally in June. 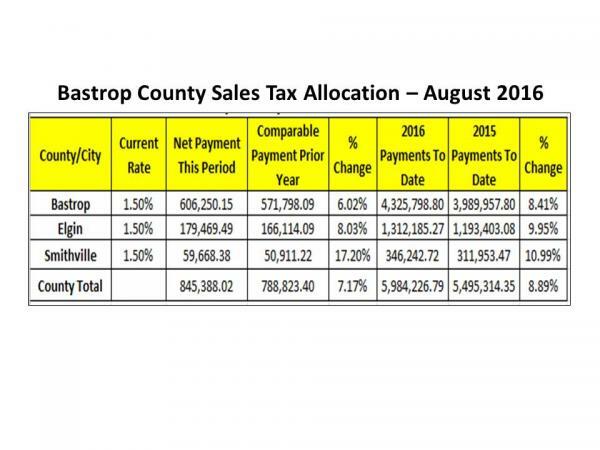 Our year-to-date sales tax allocations are $346,242 and trending positive at 10.99% (the highest percentage change in Bastrop County). Sales tax dollars are used to make street / road repairs and help pay for community services like FIRE and POLICE. Remember --- SHOP LOCAL….it makes a difference!! !